Understanding why summer camps are tightening care package restrictions makes it easier to avoid a returned package! 1. No Food: All sorts of critters from bugs to bears are drawn to food! Best to keep edibles out of care packages! 2. Keep The Packages Small: Imagine storing and sorting through mountains of boxes every day! Then delivering packages with in the camp…and throwing away all that packaging. Good grief! 3. Limit the Number of Packages Sent: Once again, most camps don’t have space or the counselor power to handle hundreds of boxes. 4. 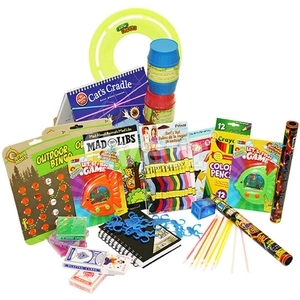 Banned Items: The most common taboos (besides food and candy) include electronics, fireworks, water pistols (or anything shaped like a gun), spray color, and silly string. 5. Flat Packs or Large Envelopes Only: More and more camps are changing their policies to only allow large USPS padded envelopes. Don’t despair! Look for puzzle books, card games,and inflatables. You might also include the makings for friendship bracelets, origami papers, journals, sketchbooks….Believe me, plenty of fun can fit in one of those envelopes! 6. No Care Packages at All: Distressing for parents, grandparents, aunts, and uncles but your camper will probably be too busy to care! Before you spend hours shopping, and packing, and shipping, be sure to check your child’s current camp care package policy! A happy camp means a happy camper! Mirth in a Box sells funny and unusual care packages for campers and college students. We have plenty of traditional care packages, over a dozen flat packs and if neither of those options float your boat, you can create your own custom care package by choosing from 100’s of items in our Build Your Own Box section!